Compost, Rock Materials, Sugars and Mulch. 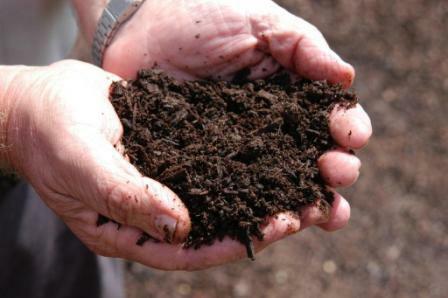 Compost, Nature’s own living fertilizer, can be made at home or purchased ready-to-use. It can be started any time of the year in sun or shade and anything once living can go in the compost. Some common ingredients include grass clippings, tree trimmings, food scraps, bark, sawdust, rice hulls, weeds, nut hulls and animal manure. Build by mixing the ingredients together into a pile on the ground. The ideal mixture is around 80% vegetative matters and 20% animal waste, although any mix will compost and work fine. Oxygen is a critical component. 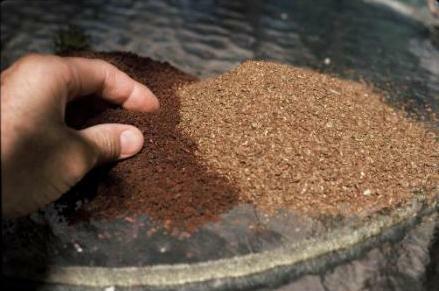 Ingredients should be a mix of coarse and fine-textured material to promote air circulation through the pile. Turn the pile as time allows to speed up the process, however turning is not critical. Another critical component is water. A compost pile should be roughly the moisture of a squeezed-out sponge to help the living organisms thrive and work their magic. Compost is ready to use as a soil amendment when the ingredients are no longer identifiable. The color will be dark brown, the texture soft and crumbly, and the smell will be pleasant like the forest floor. 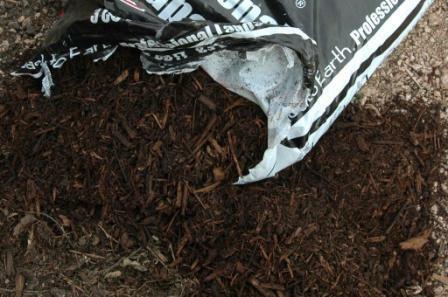 Rough, unfinished compost can be used as topdressing mulch around all plantings. For piles that are not heating and composting too slowly, add dry molasses, green plant material or other organic fertilizer. Nature has maintained the mineral balance of soil through volcanic eruptions, glaciers movement and bed rock erosion. Gardeners, farmers and ranchers need to apply rock materials as well. Don’t worry about pH. When a balance of natural materials are used, pH will move to an appropriate level. Additional volcanic rock is not needed in volcanic soils. Useful rock products include lava sand, basalt, zeolite, humate, rock phosphate, and other rock material different from the base rock on the property. With an approximate analysis is 1-0-5, molasses is a good, quick source of energy for soil life and microbes in compost piles. Liquid molasses is used in sprays, and dry molasses is broadcast. Liquid molasses is an excellent foliar feeding material and can be mixed with other organic liquids. Use at 2-4 quarts/acre for soil application. For foliar application, use up to 1 quart per acre. Use 1 – 2 oz. per gallon of spray for small scale work. Liquid molasses can also be used to increase the life and effectiveness of organic and biological pest control sprays such at Bt (Bacillus thuringiensis). Cornmeal: This food product has several horticultural uses. Regular cornmeal from the grocery store has minor fertilizer and disease fighting properties. Read the label to know for sure, but both are effective. Many cornmeal products in the grocery store consist of the starchy endosperm (insides of the kernel). Dr. Joe McFarland and his staff at the A & M Research station in Stephenville, Texas discovered that cornmeal is effective at controlling fungal diseases on peanuts. I started playing with it and discovered that it is effective on brown patch in St. Augustine and damping off disease in seedlings. The usual rate is about 20 lbs. per 1,000 sq. ft. per surface area of soil. Cornmeal will help control all diseases on photinia, Indian hawthorn, roses, fruit trees, turf and seed flats. Corn gluten meal is the protein part of the kernel and used as a weed and feed fertilizer. It also has some disease fighting properties.